Use These Moves For A Healthy Digestive System | Gastrointestinal Specialists, Inc.
Yoga is a natural healing exercise that has existed to cure the ailments of the body for many centuries. 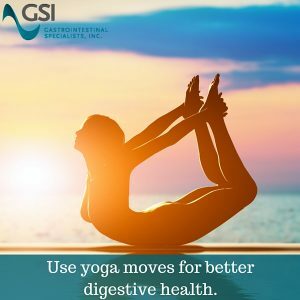 Many people practice yoga to tone their body and make themselves stronger, but it’s also an excellent way to regulate your body functions as well, especially your digestive system. The twists of yoga moves can squeeze your liver to better aid in getting rid of toxins from your body, and every deep breath you take gives your organs a massage to ease the flow of digestion. A healthy digestive system is a key to a stronger body. Here are three easy yoga moves to practice on your own for better digestion. Deep breathing in these poses will bring fresh blood to the cells responsible for the healthy function of your stomach. Start by placing your hands underneath your shoulders, and your knees under your hips. Inhale deeply, with your stomach dropping towards the ground, and exhale deeply, rounding your back out. Repeat this cycle five times. This pose stretches your stomach, which will relieve cramps you may be feeling after your meal. Place your hands and knees on the floor, and then walk your hands forward to their maximum length, keeping your hips in place. Relax your head on the floor or a yoga block to release any tension, and take five deep breaths. The bridge pose is great for circulation of blood throughout your body and reduces fatigue, which is a symptom of poor digestion. With your feet and back completely flat on the ground, move your feet as close to your seat as you can take them. From there, take a deep inhale and on the exhale, lift your core towards the ceiling and stay in the bridge position for 5 seconds. Once you finish, take another deep inhale, and when you exhale, roll your spine and move your back to the floor. Digestive health is important because it sets the tone for the rest of your body. If your digestive system is not feeling good, in turn, other functions of your body can work improperly. By practicing these moves, whether it’s after breakfast to start your day, or after dinner to finish your day, you can be sure to keep your body running smoothly. If you find yourself having digestive problems that don’t improve, ask your doctor to refer you to us, and we’ll be happy to help.